In stock -This product will ship today if ordered within the next 9 hours and 15 minutes. 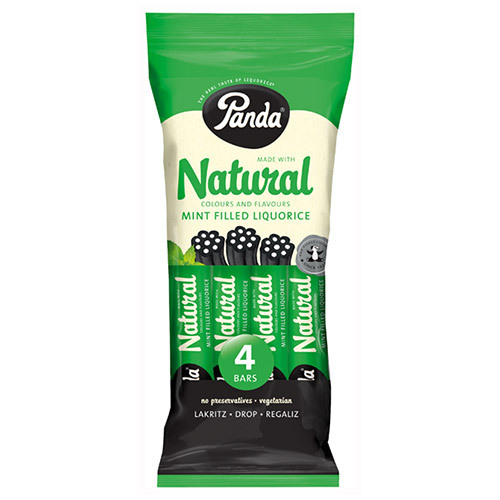 Panda Mint Filled Liquorice Bars are made with all natural colours and flavours. They are the perfect combination of Panda`s award winning original liquorice and a refreshing, creamy mint filled centre. Great for on-the-go snacking and adding to kids lunchboxes. The famous, wonderfully soft Panda liquorice is prepared by a conventional cooking method, in which the raw materials are boiled into dough and then compressed into their form in accordance with the liquorice master Väinö Hilden’s legacy recipe. Liquorice production began in 1927 in Vaajakoski, western Finland. 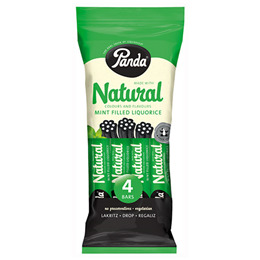 And to this day, Panda’s liquorice has reached the market leader position in liquorice products. Molasses syrup, wheat flour, sugar, vegetable fats (palm kernel, palm, shea kernel), liquorice extract, rice starch, emulsifier (lecithin), natural flavourings (peppermint oil, aniseed oil), acidity regulator (citric acid). Below are reviews of Panda Mint Filled Liquorice Bars - 4 x 26g by bodykind customers. If you have tried this product we'd love to hear what you think so please leave a review.